R. (cf. 1) Let us go rejoicing to the house of the Lord. King David! Jerusalem as the kingdom! Saint Paul killing it as always! The good thief! So much length and depth in these four readings. As I prayed and read, what I kept coming back to, what really cuts me to the heart, is the choice of the Gospel itself for today. Today is the feast of Christ the King. It ends our liturgical year as Christians, and it’s our last hurrah of Ordinary Time before the anticipatory season of advent begins. And this is how the Church wants to leave the year—with the reminder of who really reigns. Not only are we given this awesome feast today, but the Gospel chosen for the feast is perhaps unexpected. We are celebrating Our Lord Jesus Christ, King of the Universe, by golly, so why are we reading about His horrific death?! Folly to the world, but gold for us. 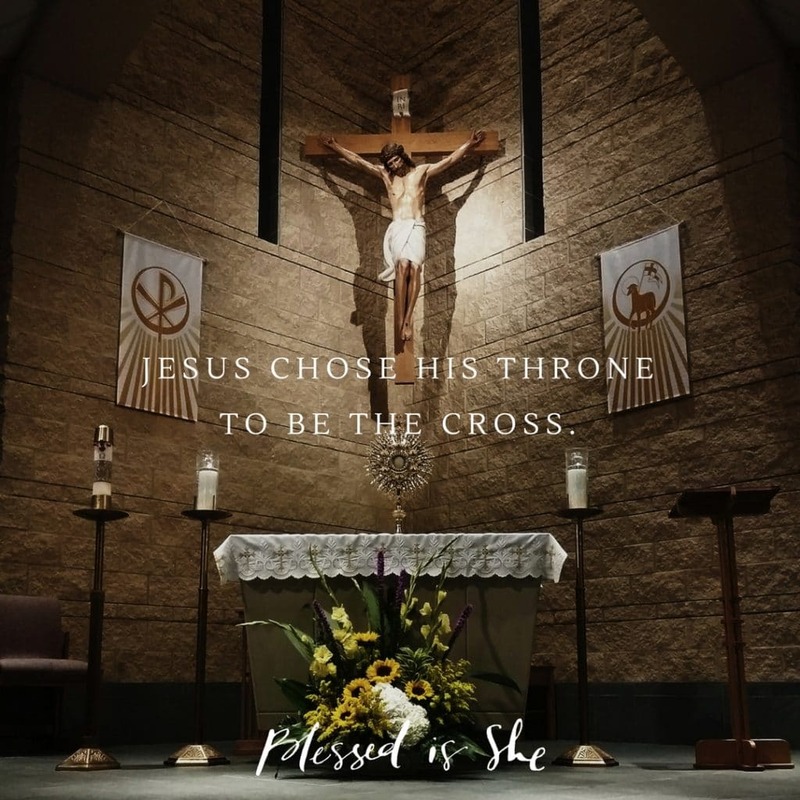 Jesus chose His throne to be the Cross. The Cross is where He is most glorious because it is where He is most sacrificial. It is where His sovereignty is most evident, to those with the eyes of faith. And it’s a hard truth, isn’t it? That our King is one who suffered so greatly. But at the end of the day, His suffering blesses our suffering. He has shown us the way to true glory and majesty, and it is precisely through offering our troubles and our pain for the good of others. So on this feast day, dear sisters, let’s make our throne to be our cross. What is weighing heavily on your heart today? What are you struggling through? What are you pushing through? What are you smiling through? Is it physical pain? Mental anguish? Emotional turmoil? Spiritual aridity? Let Christ the King be your Savior today. The Cross is where He is most glorious because it is where He is most sacrificial. Take a few moments to reflect on what your cross is in this moment of your life. Then, offer it to the King of the Universe, who cares so very deeply for you, and allow Him to resurrect your trials into your victories.